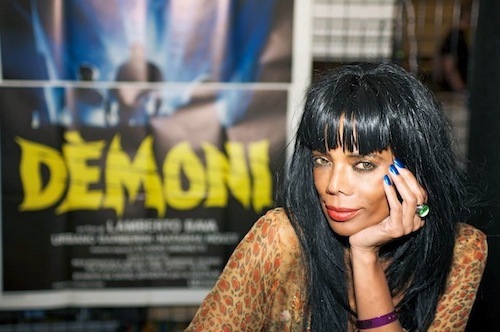 DEMONS star Geretta Geretta will be doing a signing and Q&A at Reel Art Collectibles Sept. 1st! DEMONS with star GERETTA GERETTA in person! - (Sept. 1st from 1pm-6pm) Meet star Geretta Geretta! She will be signing photo stills, Demon dolls, and will have Blu-Rays for purchase. DEMONS screens around 3:30pm-4pm. Fans may bring some of their own items to get signed, as well. Reel Art Collectibles, 6727 Stanley Avenue, Berwyn, IL 60402. KING COHEN: The Wild World of Filmmaker Larry Cohen - (Aug. 31st-Sept. 6th) A must-see documentary for Cohen fans! He's made so many cult favorites, such as The Stuff, It's Alive, Black Caesar, Q: The Winged Serpent, The Ambulance, and more. Learn about the man behind all of these great flicks and why he is a living legend. Facets Cinémathèque, 1517 W. Fullerton, Chicago, IL. REVENGE - (Aug. 31st & Sept. 1st at 10pm) Two shows only! Norwegian horror-thriller about a woman goes on a manhunt after they sorely underestimated her ability to survive and fight back. Facets Cinémathèque, 1517 W. Fullerton, Chicago, IL. HEREDITARY - (Aug. 31st-Sept. 6th) Ari Aster's brilliant film screens daily at The Music Box Theatre, 3733 N. Southport Avenue, Chicago, IL 60613. THE FOREST OF LOST SOULS - (Aug. 31st-Sept. 6th) Two strangers visit a forest intending to end their lives, but meet and decide to explore the forest while getting to know each other, which goes horribly wrong. Facets Cinémathèque, 1517 W. Fullerton, Chicago, IL. THE VIOLENCE MOVIE - (Aug. 31st at 8:30pm) Windy City Horrorama presents this screening at Bucket O' Blood Books & Records, 3182 N. Elston, Chicago, IL 60618. SUNSET BOULEVARD [35mm] - (Sept. 1st, 2nd, 3rd at 11:30am) Matinee magnificence! Highly recommended. The Music Box Theatre, 3733 N. Southport Avenue, Chicago, IL 60613. Logan Theatre movies - Great selection this weekend: The Happytime Murders, The Black KKKlansman, The Goonies, Indiana Jones and the Temple of Doom, Sorry to Bother You, and Crazy Rich Asians. 2646 N. Milwaukee Avenue, Chicago, IL 60647. THREE IDENTICAL STRANGERS - (through Sept. 6th) Stranger than fiction documentary about three strangers who reunite after having been separated at birth and adopted by different families. Times vary. The Music Box Theatre, 3733 N. Southport Avenue, Chicago, IL 60613. Fearless Women in Science Fiction - (Sept. 4th at 6:30pm) Discussion with accomplished sci-fi writers Mary Robinette Kowal, Sue Burke, and Tessa Gratton. American Writers Museum, 180 N. Michigan Ave., 2nd Floor, Chicago, IL 60601. The Hunting Accident Discussion - (Sept. 6th at 6:30pm) Author David L. Carlson discusses his true crime graphic novel with Landis Blair and Charlie Rizzo. American Writers Museum, 180 N. Michigan Ave., 2nd Floor, Chicago, IL 60601. 70mm Film Festival - (Sept. 14th-27th) Music Box Theatre. NOSFERATU with Live Organ - (Sept. 27th) Davis Theater, 4614 N. Lincoln. Chicago Horror Film Festival - (Sept. 28th) DeKalb, IL. The Massacre 24-Hour Film Fest - (Sept. 29th) AN AMERICAN WEREWOLF IN LONDON, THE CHANGELING, PLAGUE OF THE ZOMBIES, NIGHTBREED, PEOPLE UNDER THE STAIRS, and more. Davis Theater, 4614 N. Lincoln. Wheaton Haunted Halloween Flea Market - (Oct. 20th) Special guest Robert Mukes (Bone Tomahawk, House of 1000 Corpses, Westworld) DuPage County Fairgrounds, Wheaton, IL.